Black moss fungi is perhaps most well-known as an Asian vegetable. This food source is actually a terrestrial cyanobacteria, which means that it is a blue-green algae that grows in the soil. The popularity of black moss fungi -- also known as fat choy or fatt choy -- as a food source has led to some controversy concerning the environmental effect of its harvesting, as well as possible health concerns. What is Black Moss Fungi? The scientific name for black moss fungi is Nostoc flagelliform, a member of the cyanobacteria family. Cyanobacteria contain chlorophyll and have photosynthetic capabilities, which make them more like a plant than a fungus. They are also one of the world’s oldest known phototrophic organisms -- plants that grow toward sunlight -- whose origins date back about 2.5 billion years. 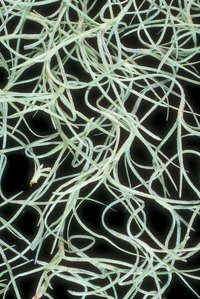 The blue-green color of this organism in its natural state changes to black when the strands become dried out. The epicurean origins of black moss fungi are found in regions of Northern China, where this food stuff grows abundantly. Black moss fungi is used especially in festivities related to the Chinese New Year, perhaps because of the fact that “fat choy” is part of a Chinese holiday greeting, kung hei fat choy, which translates to English as a wish for good luck or good fortune. Traditional Chinese cuisine calls for soaking black moss fungi strands, which renders it into a vermicelli-like appearance, and then cooking it with fish belly and mushrooms to be served during the Chinese New Year festivities. The extensive and continuous harvesting of black moss fungi has had some negative environmental impact according to Wayne P. Armstrong, professor of biology at Palomar College in San Marcos, California. Professor Armstrong, writing for his website “Wayne’s Word,” states that the Chinese government has taken steps to deter the exploitation of black moss fungi. The reason given is that because this fungus grows up to 3 feet deep in the ground, some damage to the substrate from harvesting of fat choy has caused a lack of cohesion in the soil, making it vulnerable to water and wind erosion. Research studies done by the department of biochemistry at the Chinese University of Hong Kong suggested that black moss fungi as a food presents some serious health risks. Research team member Professor Chang King-ming singled out a toxic amino acid-BNAA-that could potentially lead to degenerative diseases such as Alzheimer’s, Parkinson’s, and dementia. The Standard newspaper of Hong Kong, reporting on these findings in 2007, also reports that the State government banned the export and harvesting of black moss fungi in 2000 when it became listed as an endangered species, raising both environmental and health risk concerns related to fat choy.